A battling unbeaten half century from former captain Angelo Mathews guided Sri Lanka to 136 for five at tea on day two of the opening test against England on Wednesday after the tourists had been dismissed for 342. Sri Lanka slumped to 40-4 following a top order collapse but Mathews arrested the slide in a 75-run stand with skipper Dinesh Chandimal, who braved a groin injury to make 33. Niroshan Dickwella will resume 11 along with Mathews, who had made 52 not out, after the break with Sri Lanka still 206 runs behind. Mathews hit three boundaries in his composed innings, batting as if to silence questions about his fitness and running between wickets. Earlier, all eyes were on Ben Foakes when he resumed needing 13 runs for a century in his first test innings with England on 321-8. The 25-year-old hit the first ball of the day for a boundary but risked running out of partners after Jack Leach became off-spinner Dilruwan Perera's fifth victim. The right-hander hit Suranga Lakmal for three boundaries in the following over before falling to the paceman. 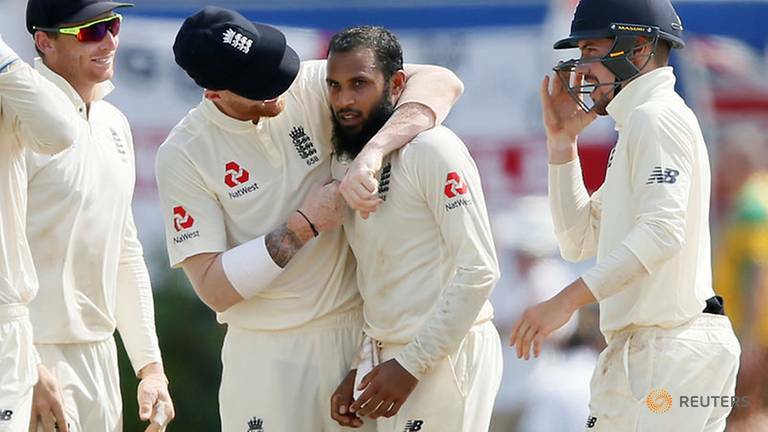 Sam Curran trapped Kaushal Silva leg before for one to compound Sri Lanka's problem and England's spin duo of Jack Leach and Moeen Ali also tasted early success to intensify the pressure on their hosts. Mathews and Chandimal resisted the English bowlers to take Sri Lanka past the 100-mark but Adil Rashid had the Sri Lanka captain stumped with Foakes once again finding himself in the thick of things. Rory Burns continued to endure a constrasting debut with the 28-year-old, who made nine in the first innings, being hit on the back of the neck from a Dickwella sweep shot.